Choosing the material for your pathways and entryways is an incredibly important design choice for your home. Pathways and entryways perform a function, so unlike other design aspects, it’s about so much more than aesthetics. Your pathways and entryways will usually be the most high-traffic areas of your home. That means the material you choose needs to be designed for constant impact, while still adding to the curb appeal of your house. Here’s why decorative concrete does just that. There’s a reason concrete is the most used construction material on the planet. It’s used for everything from skyscrapers to cubby houses because it is tough, and it lasts forever. All that compacted sand and gravel adds up to something that is designed to last, and that’s what you need for your pathways and entryways. If it is poured right and you add the right sealer, your decorative concrete will look as good as new forever. Your other options for pathways and entryways are pavers or natural stone, both of which are high-maintenance. Unlike concrete, both these options consist of sections that are grouted together. This grouting doesn’t last forever, and if one section cracks or breaks it can be hard to find one that matches. Most natural stone options will also have sensitive cleaning demands. To look after decorative concrete, you only need to seal it every 5-10 years, and the cleaning requirements are just a sweep and hose down every now and then. If you want to keep your weekends, decorative concrete is your best option. Decorative concrete practices essentially turn concrete into a blank canvas for you to create with. With stamping, stencilling and painting your pathways and entryways can become anything you like. With one material, your entryway can look like sandstone or brick, while your pathways can look like bluestone. The choice is entirely yours, and you aren’t limited by the natural appearance of quarried stone or a precast paver. You also have flexibility regarding the shapes you can create. Concrete starts off in liquid form so you can shape it in any way you like. With pavers and stone, you are limited by the existing shape. Decorative concrete is far more cost-effective than other hardscape options. Natural stone is costly, and because you need a stonemason to shape the stone, the cost of labour adds to the initial price. Pavers are slightly cheaper, but they are still more expensive than decorative concrete. As a base material, concrete is inexpensive, and it is less labour intensive than other options, so you’ll save on labour. You also save money in the long run because you won’t have to replace your concrete as quickly as you would have to replace natural stone or pavers. In fact, once it is laid, the only cost you’ll need to come up with is the cost of a sealer in 5-10 year’s time. The cost-effective and flexible nature of concrete means it can be used far beyond your pathways and entryway. 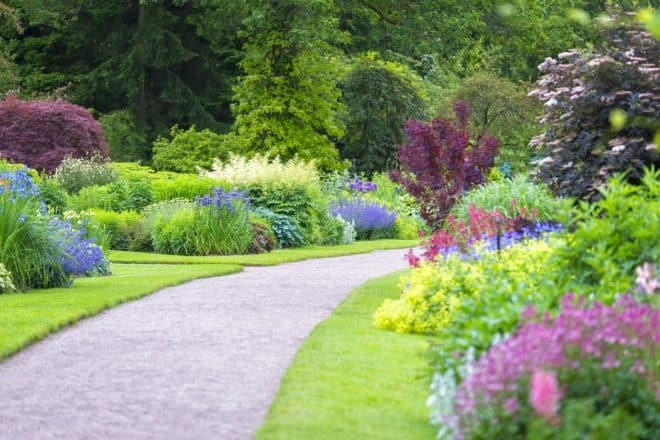 In fact, you can create a flow on effect and use it right throughout your landscaping projects. Using the same design techniques gives your home fluidity, and gives it a sense of wholeness that is essential in creating that homely feel that is so important. With stencilling, stamping and colouring techniques you can create a design that is entirely your own. If you want a family crest included in your entryway, go for it! Ok, maybe that is a little over the top, but you really can do anything you like with your decorative concrete. Your home should be your own, and that extends to your entryways and pathways. You can mix and match colours, textures, stencils and prints to develop a style that suits your personality and the type of home you want to create. It’s rare you come across a material that offers this stylistic freedom, while still being cost-effective and incredibly functional. If you’re in the process of researching materials for your pathways and entryways, decorative concrete should be at the top of your list. You really can’t go wrong, especially when you consider that the final design is entirely in your hands and the design you create will last forever.